My manager called me and asked if i would like to have an annual leave today so I agreed as i am still recovering from night shift. Thus, I am doing my hair mask now, writing my blog and doing another facial mask later in the day, cook dinner for my beloved fiancé. 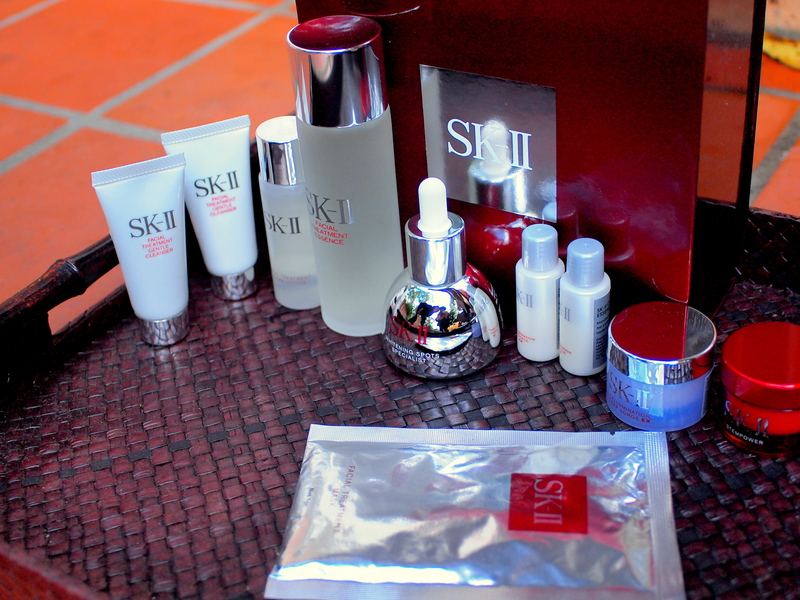 I’d like to share some SK II products I have used. First of all, I am not a SK II fan as their products are not cheap. I have also heard rumours saying that some people will be ‘dependent’ on the products as in other products do not work for them anymore. (Sounds a bit scary as that reminds me of drug withdrawals). Anyway, let me start. I am looking for a spot whitener for quite a while already and everything has failed me. Thus I went to David Jones the other day and bought several items with a few partners in crime. Facial treatment Gentle Cleanser. 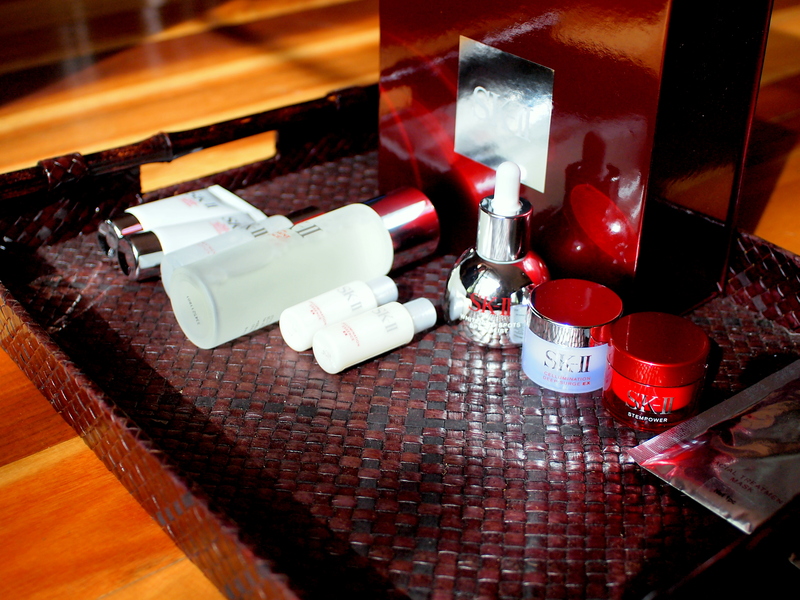 It contains concentrated Pitera and mild treatment essence to keep our skin well hydrated. I normally use it with my Clarisonic Mia 2. Facial treatment Clear Lotion is next. To me, it acts like an extra step to my cleansing process. Please remember, a clean face will enhance product absorption and prevent outbreak of blackhead/pimples. I pour some on a cotton pad then wipe it upwards to remove any dead skin and dirt. Facial Treatment Essence, the most popular product in SK II, Chinese calls it the ‘miracle water’ as it is rich in Pitera. ok, let me introduce what is Pitera and what does it do to your skin. Scientists have noticed that the hands of people who worked in Sake Brewery are smooth. Thank God they are able to isolate the liquid and they called it the Pitera. It nourishes the skin and help balance the skin’s pH and sebum secretion. Like what I have said yesterday in my previous post, balanced oil and water is essential is having a perfect face as you will not have issues with oily/dehydrated skin. I bought this particular product for my mum when i last went back to Malaysia and my mum said her face feels much hydrated. As for me, I have got oily T Zone as I have combination skin. After using it, my T Zone was not as oily as before even in Malaysia. I am pretty amazed. I don’t really like the scent but oh well. I guess I will just have to put up with that.The best thing about this is you can use it around the eye area as well. Happy Happy. I will soak it on a cotton pad and put it on areas that I feel needs the most hydration when I am lazy to use a mask. The most important part of my skincare routine is whitening serum. I am using the Whitening Spot Specialist. This product is new to their range and I am sure that the US called it differently. I was recommended to use it on the whole face but i kinda refrain as the product is not cheap. 30 mls for $135 i think. This product targets both visible and hidden spots. I will use it on the whole face once I strike Lotto/when I turn 26. Next up, Cellumination Essence, this helps with whitening and boosting the skin’s radiance. a pearl size drop will do for the whole face. I normally don’t use this on a daily basis as I am using whitening spot specialist. But I have seen my friend’s before and after, the result was amazing, the fine lines are not that obvious and the whitening effect is awesome! I will purchase a full size for this product. Cellumination Deep Surge is a moisturiser (whitening moisturiser rather) to help with our skin tone. I don’t use this daily as well as I am a big fan of Stempower! The ultimate Stempower cream. This gives us firm skin, as I have huge cheeks so I really need this before my cheeks fall to Antarctica due to gravity. I bought one for my mum as well and used it on her and by massaging it upwards with the cream, lines are reduced and i can see my mum’s face being lifted. It is a very well hydrated moisturiser as well. Last but not least, the facial treatment mask. I don’t use this as my weekly mask, I only use this after spending long hours on the beach or after I finish 2 night shifts. I only use this when my skin is in distress and I use it as a SOS/emergency mask. This is not my everyday mask once again, because of the price and I that I am happy with my beauty diary mask. They work so well for me. 2) SK II Skin Signature Eye Cream.